I write from the Surgery outpatient waiting room at Children’s. I have a pink bracelet today. That is always better than another color. 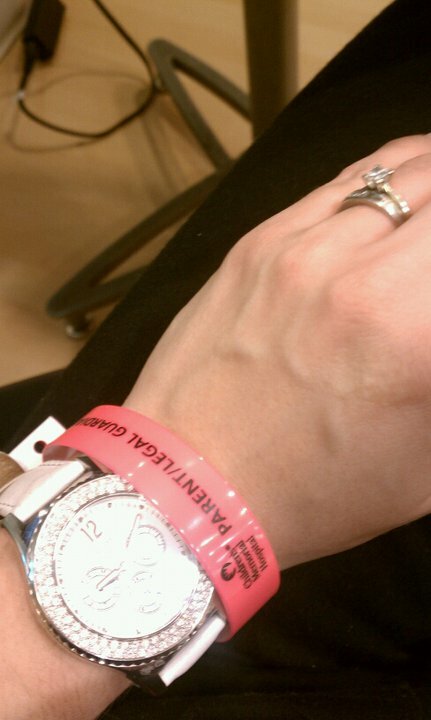 Pink means outpatient….it means I have a good chance of leaving today. I scan the room for different colors, worried faces, and other parents trying to kill time. I see the dr’s come in and out and pray no one has to go in “the” room. You know, the bad news room. I actually like hospitals. I feel safe at hospitals. It is the best place to be if you’re sick, or in Brooklyn’s case, need ear tubes replaced and andoids removed. I am reminded quickly how easy it would be to “feel sorry” for myself but as the flat screen blabs at me, the Mcdonalds tastes good, and the microwave another parent is using beeps….I am reminded of how lucky I am to be sitting here and not in India with the same needs. Or at my daughter’s visitation, like my dear friend Val, who is saying “see you later” to her 15 year old daughter who went to heaven just days ago, Steffany, thanks to Sanfilippo. There are moments where we have to wake up and really ask ourselves, what are we complaining about? What are we doing with our days? Or, the dear woman that lost Ben, a 30 a husband and father abruptly only to find out days later, she is also going to loose her 2 year old to a flesh eating bacteria. We need to wake up. I need to wake up. I know it is hard to see God in this. The truth is, He isn’t. Sure, there is a part of Him “allowing” things to happen, …and he is walking with us through it, but God is good and hates evil things like death and sickness. Heaven is real so if we hate the evil things of the world, too, don’t blame God…hope for heaven where the pain of this world is gone. Earth, the way God originally created it to be, is restored. Hope for a place where hurt is restored, were loved ones are healed and never die. Where there is no hunger, no slavery, no colored bracelets, and no visitations. Justin is on his way traveling through time on his 40 hour journey home from Tenali, India. It has been a long 9 days and he still has one more today of travel. He is supposed to arrive Wednesday afternoon. I am so excited to see him and really miss him. Even though I was with people the entire time, I felt alone. I have a growing sense that my other half is missing. We are a well-oiled machine and I feel like the oil is gone. More than the breakfasts, diapers, dishes, cleaning, lifting, sleeping, etc that we share, we are witnesses to each other’s life. We see one another and share life through similar eyes. We wear pink bracelets together. All that to say these 10 days were stretching for me too. I was experiencing India second hand as well as experiencing single-motherhood with toddlers with special needs and everything else I do. I learned I need to do more with the kids during breakfast becuase Jut lets me sleep in and breakfast is hard. I can feed the dog. I can appreciate him and love him better. I also had a struggle in Rockford. I was supposed to spend the weekend there but it was too hard. For many reasons, I left and came home. I couldn’t handle the stress of being out of my semi-childproof home, away from Jut, back in Rockford. My mother and I have had a strained relationship for years and it is mostly because of me. I left before my sharp tounge was unleashed. I went to a place of refuge, my dear friend Kelly. She has awesome…even when Jayden drew in black crayon on her wall. Becuase of Christ refining yet another part of me, I was obedient and called my mom to apologize-something I don’t do well. I have to say it was the most healing, positive conversation we have had in years. I have reached a point in my journey where I have to lay down all the boxes/expectations of other people to be, or say, or do what I want to meet my needs….and free them to be who they are. I want to love my mom for who God made her and let go of all the perfections that I wanted her to be for me. It is a process but I feel I am one step closer to healing that relationship. Oprah has the most talented kids on her show today. I can hear the tv above me as I type while I see a father in the waiting room crying for his child. Why here, Oprah, and why today? How do we navigate these two worlds? Dr. Billings just came in to say Brooklyn did well and is out of surgery….everything was routine.I love that word, ROUTINE And at the same moment, I am overhearing the other family saying that their baby is their miracle baby and survived heart failure once before….I pray for that family. This is so difficult. I pray that I can acknowledge both worlds and see God providing in both. He is comforting at the visitation, he is waiting patiently with the other family in the waiting room, and he is traveling with Jut and the boys. Today, He is with me going home.